Taipei, Dec. 8 (CNA) An animation calling for an end to the culture of victim blaming emerged as one of the best design winners in the visual communication design category at the annual Golden Pin Design Award in Taipei on Thursday. The animation, titled "The Mystery of Victim Blaming," explores the psychology of victim blaming, especially in cases of sexual assault, and urges the pubic to fight against their own prejudices, learn more about the topic and support victims. "The limited color palette and use of silhouettes in 'The Mystery of Victim Blaming,' focuses the viewer on the story and information that the work is trying to convey," according to the judges. "The topic is simple, concise, and clear, presented through crisp animation, which shows a strong sense of visual direction," they added. Stanley Wang (王成祥), co-founder of SimpleInfo Design Co. (簡訊設計), which produced the animation, told CNA he hopes it will inspire people to stop blaming victims of abuse, accidents and other unfortunate events. "We hope to gradually affect change and make our society better one step at a time," said Chang Chih-chyi (張志祺), the other co-founder of the company, which creates animation and graphic designs to spread information about social and other issues. Other best design winners were selected in four categories: product design, visual communication design, packaging design and spatial design. Winners included GS1 Projector -- a portable, cable free projector designed for use at outdoor campsites by BenQ Corp.; Wen Aiyi's Love Poems -- a concept book about poetry and love by Guangxi Fine Arts Publishing House; and MR1s DB S8E -- a super lightweight road bike for hill climbing by DARE-BIKES. The Golden Pin Design Award, now in its 37th year, was established by the Ministry of Economic Affairs' Industrial Development Bureau to recognize innovative designs in the Chinese-speaking world. Of the 23 best design winners, 16 were from Taiwan, 3 from Japan, 2 from China, and 1 each from Hong Kong and Germany. This year, close to 3,000 designs were submitted. Meanwhile, the three winners of the Golden Pin Concept Design Award were also announced at the ceremony on Thursday. They will receive NT$300,000 (US$9,990) each to help bring their concepts to life. 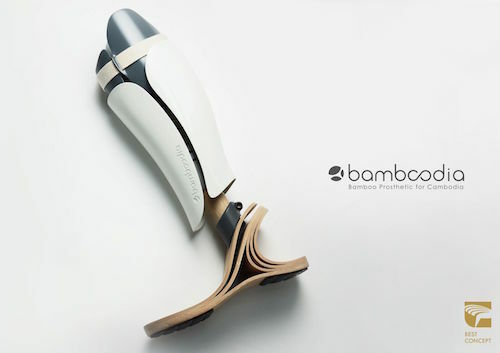 "Bamboodia," a low-cost prosthetic made from bamboo by Tunghai University students, was among the winners. Huang Yu-man (黃羽蔓), one of the creators of the prosthetic, said the design was inspired by Cambodian children injured by land mines. "We asked ourselves what we can do for the children, and when we searched for materials to make prosthetics, we discovered that Cambodia is a major bamboo producer," she said. Bamboo is not only flexible and comfortable to walk in, but also cheaper than plastic materials and more affordable, according to Wang Yu-chi (王于齊), another creator of the prosthetic. The Golden Pin Concept Design Award, previously known as the Taiwan International Design Competition, honors designers and companies from around the world who present society-changing ideas. Over 4,000 design concepts were submitted this year.